You are here: Home > Company > Customer Stories > John J. Murphy, Jr.
John J. Murphy, Jr. is a Licensed Master Electrician and Registered Professional Engineer based in Rockland, Massachusetts. 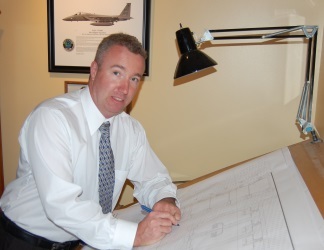 Mr. Murphy has over twenty years’ experience in the electrical field, including the design, construction bidding and construction administration of residential, commercial and industrial projects. Mr. Murphy’s diverse skills include power distribution, lighting design, fire alarm systems, telecommunications, hospital systems and life safety systems. He is also a Registered Communication Design Distribution Engineer (RCDD), LEED Green Associate and Security Contractor. Since purchasing Design Master Photometrics in 2011, Mr. Murphy has used the software to design and calculate lighting levels on a wide range of projects, including housing developments and large government buildings. “I started looking for a photometrics package when I was awarded a contract to design lighting for residential homes being built on the site of the old South Weymouth Naval Air Station,” explains Mr. Murphy. If a lighting job is big enough, fixture vendors may offer to supply a lighting design. “One reason I purchased photometric design software is that fixture vendors let me down a number of times,” says Mr. Murphy. “They’d promise me a lighting design, but when I needed it to go before a zoning board, it wouldn’t be ready. “Now I just punch the lighting data into Design Master and I meet my deadlines, no problem. The software keeps me in control, which is much better for my workflow. The program is so intuitive and powerful; it’s easier for me to do it myself than to try to get others to do it for me,” Mr. Murphy asserts. “Design Master stands behind its product 100%,” Mr. Murphy affirms. “They always get right back to me. I’ve never been left hanging in the middle of a project. Nine times out of ten it’s my error, but that doesn’t matter to them. If need be, they’ll just take control of my computer and fix things up as I watch. “Several times I’ve called their tech support in a rush and they’ve gotten me out of a jam so I could make my deadline. They treat you like a friend, which is great. “They go out of their way to get right back to me so I can get my projects done on time—that’s real partnership right there,” Mr. Murphy offers. “Design Master Photometrics has the best bang for the dollar of any lighting design software out there,” comments Mr. Murphy. “It’s far better than other products I looked at. Design Master can do everything you’d ever want to do with lighting design, including indoor fixtures. And the support is just unbeatable. “I’m sure there are other engineers out there who’ve been in predicaments similar to mine. This product will save you time and money every time you use it, and make it easy to deal with changes. “I wouldn’t want to be interviewed about any of the other software I use, but I’m glad to have the chance to talk about Design Master,” Mr. Murphy concludes.